Mixed signals. It’s a far too common phrase used by U.S. economists, policymakers and market analysts who are trying to interpret the latest economic data. Whether it’s understanding the Federal Reserve’s thinking on interest rates, or decoding Black Friday consumer spending - mixed signals are reported too often. True at the national level, these mixed signals, or no signals at all, are even more prevalent at the city level. 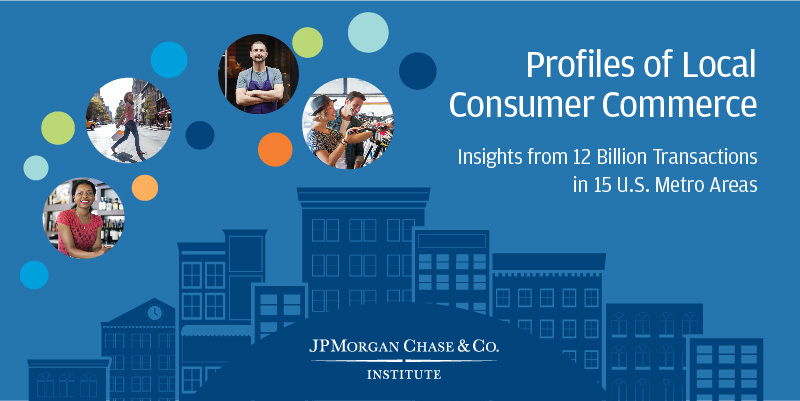 A new research report from the JPMorgan Chase Institute –Profiles of Local Consumer Commerce: Insights from 12 billion transactions in 15 U.S. Metro Areas - released today, seeks to reduce economic ambiguity and clarify mixed signals by looking in detail at the growth of everyday consumer spending in 15 major U.S. metropolitan areas. The research, using anonymized, aggregated data from 12.4 billion Chase credit and debit card transactions, shows that consumer spending slowed dramatically over the past year, from 5 percent in the second quarter of 2014 to 0.5 percent in the same quarter of 2015. The Institute’s Profiles of Local Consumer Commerce data series, which is the foundation of this first report, will be updated on a quarterly basis to provide an ongoing source of rich data that can advance the understanding of local consumer commerce and offer greater insights into 15 major metropolitan areas including: Atlanta, Chicago, Columbus, Dallas, Denver, Detroit, Houston, Los Angeles, Miami, New York, Phoenix, Portland, San Diego, San Francisco, and Seattle. Consumer spending in these 15 areas represents one-third of commerce in the United States. Future releases of the Profiles will include additional U.S. cities. Unlike other measures of local commerce, these new data comprise five important dimensions —the age and income of the consumer, the size of the business and type of product it sells, and the residence of the consumer relative to the business – and include broader spending on local consumer services beyond retail and restaurants. These are features not available through existing private or government data. In this report, we arrive at five key findings with respect to the 4.5 percentage-point slowdown in local consumer commerce over the past year. Finding One: Middle- and high-income consumers, and consumers ages 65 and older, were responsible for most of the slowdown in growth, while low-income consumers and those under 35 maintained relatively stable spending growth. Finding Two: Spending at large businesses shrunk more than spending at small- and medium-sized enterprises (SMEs); though SMEs accounted for almost as much of the slowdown in local consumer commercial spending as large businesses because they account for nearly 70 percent of local consumer commerce sales. Finding Three: Businesses saw spending slow mostly from consumers who lived in their same metropolitan area, and particularly from customers who lived in the same neighborhood as the business. Finding Four: Spending growth at businesses that sell fuel and other nondurable goods slowed dramatically, and not only because of gas price declines. Specifically, while there was a slowdown in spending on other nondurables like apparel, food, medical commodities, and recreational goods, price declines contributed only to slowing spending on apparel, and just in part. Finding Five: Strong and diverse growth across almost all of the 15 metropolitan areas from Q2 2013 to Q2 2014 slowed to tepid growth across the board from Q2 2014 to Q2 2015. There was weaker spending in nearly all 15 metropolitan areas, with no city experiencing particularly strong growth. Local consumer commercial growth among the 15 cities ranged from -1.5 percent to 2.6 percent between Q2 2014 and Q2 2015. In contrast, spending growth rates rose in most of the cities between Q2 2013 and Q2 2014, with a range of 2.7 percent to 11.2 percent. Atlanta was the exception, showing a decline in local consumer commerce in both periods. The mission of the JPMorgan Chase Institute is to provide decision makers with data, facts and analysis to make smart economic decisions. A better understanding of the dimensions of local consumer commerce, especially with city-level details, will arm policy makers, business leaders and others with better information to make sharper decisions and policies.